Here's an outfit for the days when I'm feeling bold, or the days when I'm not quite there yet, but bold is what I'm aiming for! 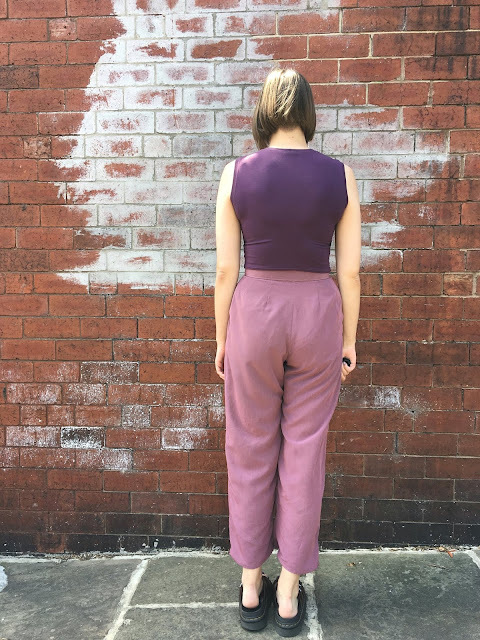 The colour scheming wasn't intentional, but these two garments are such a perfect match that they couldn't not be blogged as a pair. The new Simplicity Patterns 8609 top meets a pair of vintage pattern 'palazzos' to make (in my opinion) one hell of a strong look! I'm writing this on a day where I don't feel so bold at all, but even just looking at these pictures is making me feel colourful/fun/happy - the power of clothes eh? 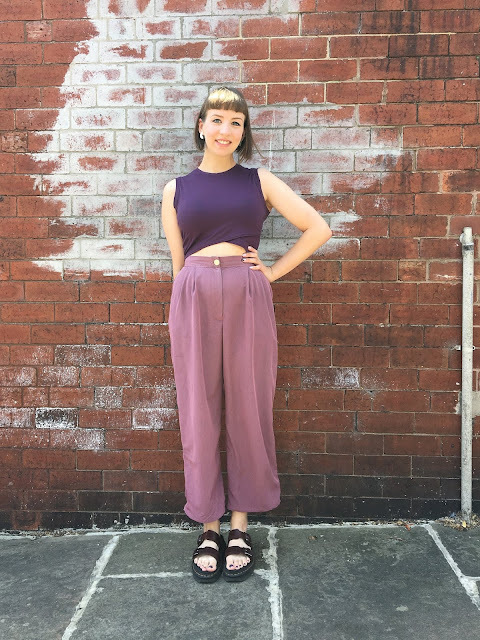 The current UK heatwave is pushing me towards styles I might not normally try, namely View B of the Simplicity 8609... a crop top (because who needs the extra bother of top tucking in in this heat)! I bought this pattern solely for the top (and possibly the long sleeved version) and in all honesty hate the other designs included. I used a good quality purple jersey from my stash that I'd bought to make a t-shirt, but the fabric requirements for this pattern are so little that I think I might have enough left for some #sewingleftovers. I made a size 12 and used only 0.5m (the pattern suggests a still measly 0.7m). My bust measurement aligned more closely with the size 14, but I downsized as I wanted a close fit without the infamous Big 4 ease. I'm glad I opted for the smaller size, as the arm holes really gaped and took some adjusting. This involved some frustrating unpicking as I'd attached the arm bands and done all the topstitching before I realised it wasn't just a little gape I could live with. I managed to get it to wearable by taking a wider side seam at the under arm, easing it out to the regular side seam at the waist. In future though, I'll probably redraw the curve of the arm holes to avoid this! Purple on purple (and even purple nails)! 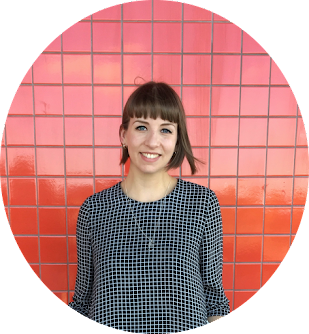 I really like the finished top and it pairs well with a lot of my current wardrobe favourites. This is probably the most naked my stomach's been in public since I wore a Spice Girls crop top in 1996, and I actually feel pretty great about it! 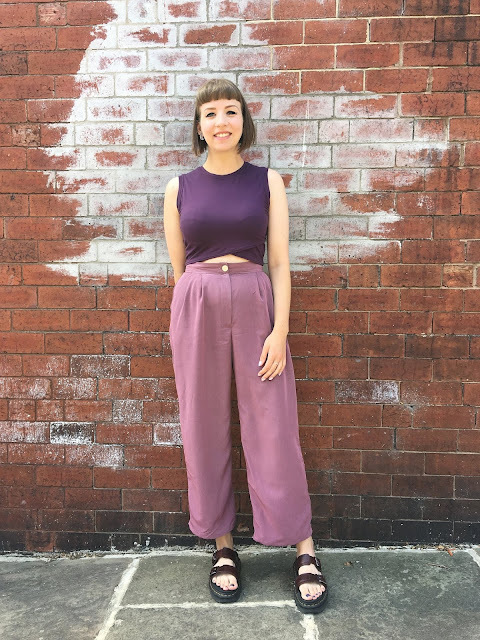 Paired with high waisted bottoms like these and my M7661 culottes, it shows just the right amount of midriff without feeling too revealing - and this pairing in particular does have a bit of a 'Girl Power' vibe to it, don't you think? 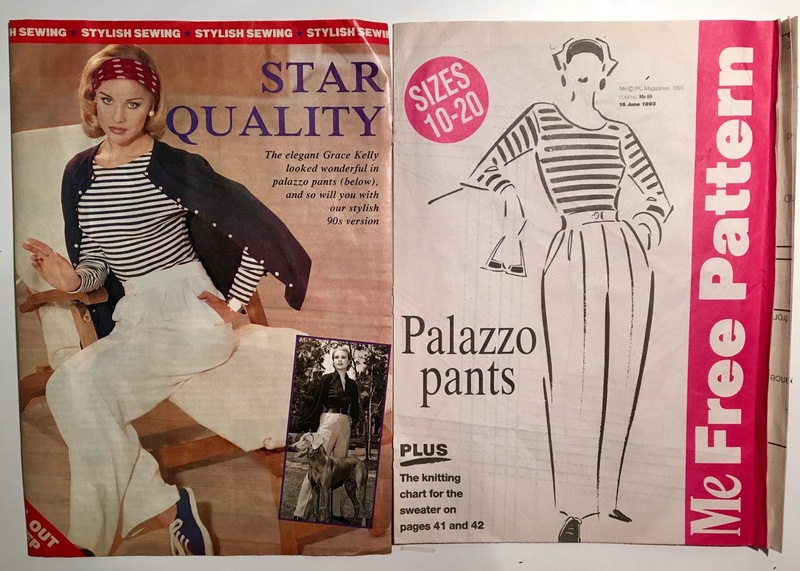 Now onto what might just be my dream trousers! 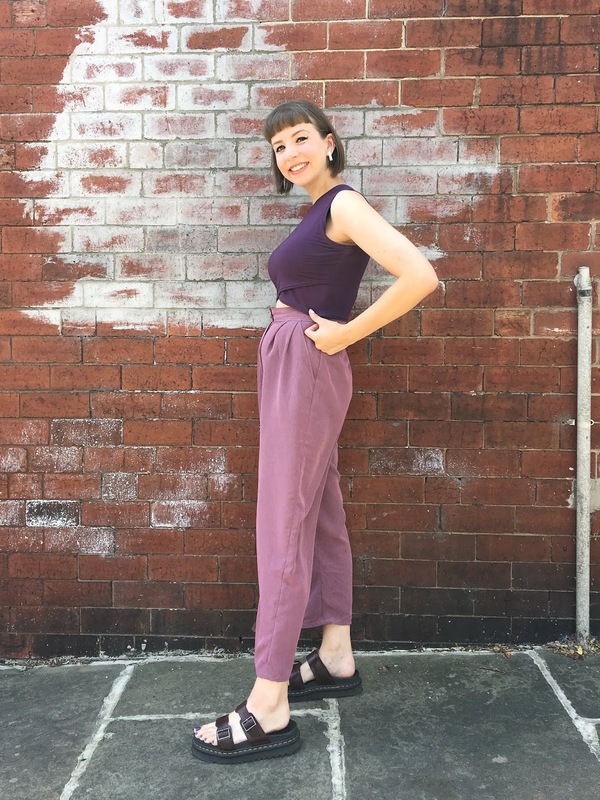 This pair are an updated version of the vintage Me Magazine Palazzo Pants Pattern from 1993. I'd just perfected the fit of them after a number of attempts before I got ill and lost weight, rendering the hard work I'd put into them pretty pointless! Whilst I've been able to adjust and take in some clothes now my weight's pretty stable, I'm slowly revisiting some of my favourite patterns to make updated versions. 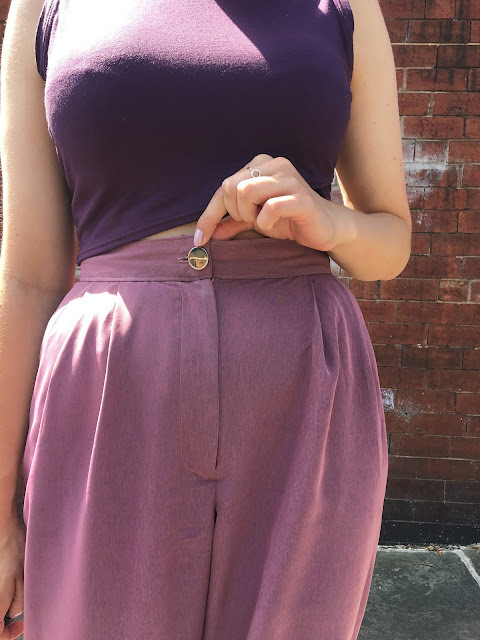 I downsized from a 14 to a 12 with these, but what I didn't anticipate was the effect this would have on the rise/crotch depth (should have known better after my long-crotch-Lander discoveries)! I salvaged them by sewing the crotch seams at 0.5cm to offer a bit more ease. Other than that small blip, the fit turned out close but comfortable, and I'm thrilled with them! The fabric is a bit lighter than I'd normally go for with trousers (maybe it's viscose? ), but it has a really nice drape that works well with the pleats and wide legs. It was a Hebden Bridge Rag Market special for only a few pounds, and I already know I'll just have to make a #sewingleftovers Reeta Shirt with what's left - can't get enough of the faux jumpsuit look at the minute! Maybe my sewing choices are subconsciously leaning towards creating a more cohesive wardrobe, or maybe this was a fluke match. Either way I totally love both garments worn together and as separates, and I'm encouraged to consider more conscious 'outfit' sewing in future. 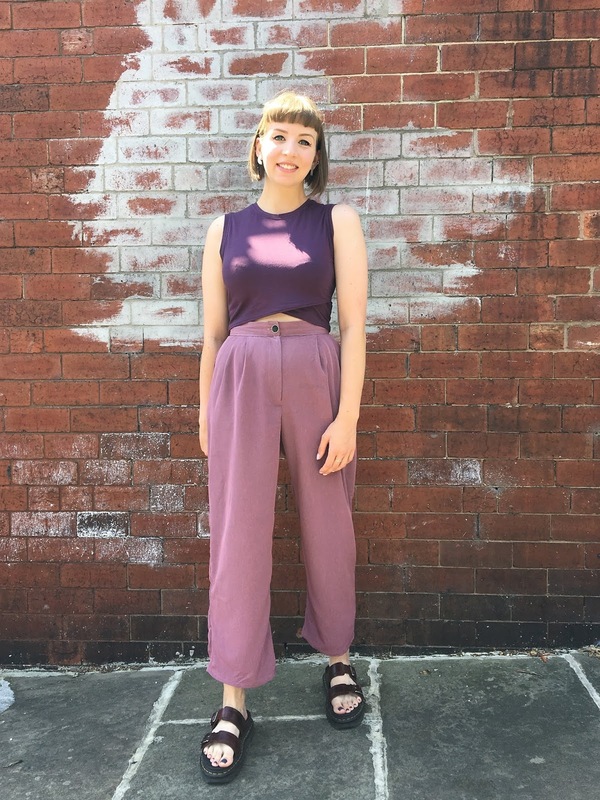 Jess (of Jess Sews Clothes) seems to have been doing quite a bit of this lately and producing some amazing results! I'm curious to know, do other sewers approach making separates with an outfit in mind? 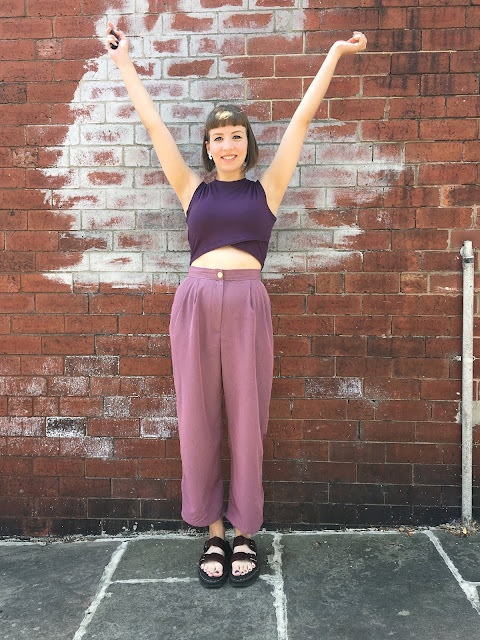 For now, catch me flashing my midriff and giving the peace sign around town - girl power! Purple looks good on you. Love the top and pants. 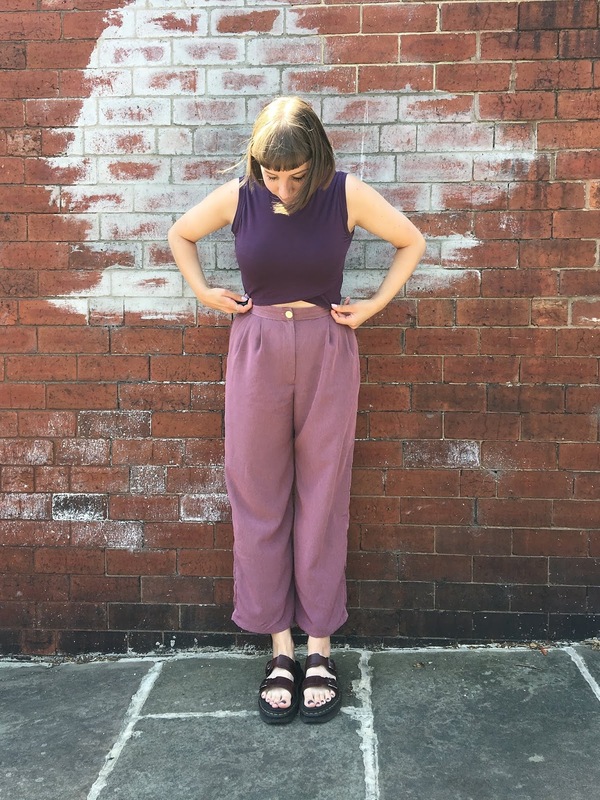 After years of making garments that never went with anything else, I now sew outfits. I plan a top bottom and usually a jacket(for work) that all co-ordinate. They might not always get worn together but at least it's a better attempt. This is is good for my enjoyment of sewing because it gives me variety instead of making the same garment type say, 5 times in a row. I AM HERE FOR THIS TOP!!!!! Wow, I had totally missed this pattern (maybe because it's easy to do that here in the US, where they're easily available and go on sale about every month for $2 each...) but now I have to have it. Nevermind that I can't wear crop tops to my office job, I need it!! Haha thanks Abbey! I totally missed the pattern - mainly overlooking it because I didn't like the skirt - but I saw a version of the top on Instagram and had to give it a go! I'm not sure I can get away with crop tops to work either, but it is nice to have something that's dedicated 'not-office' wear for once! Great outfit. I really like the top. Possibly a bit brave for me. .... maybe. ... ! 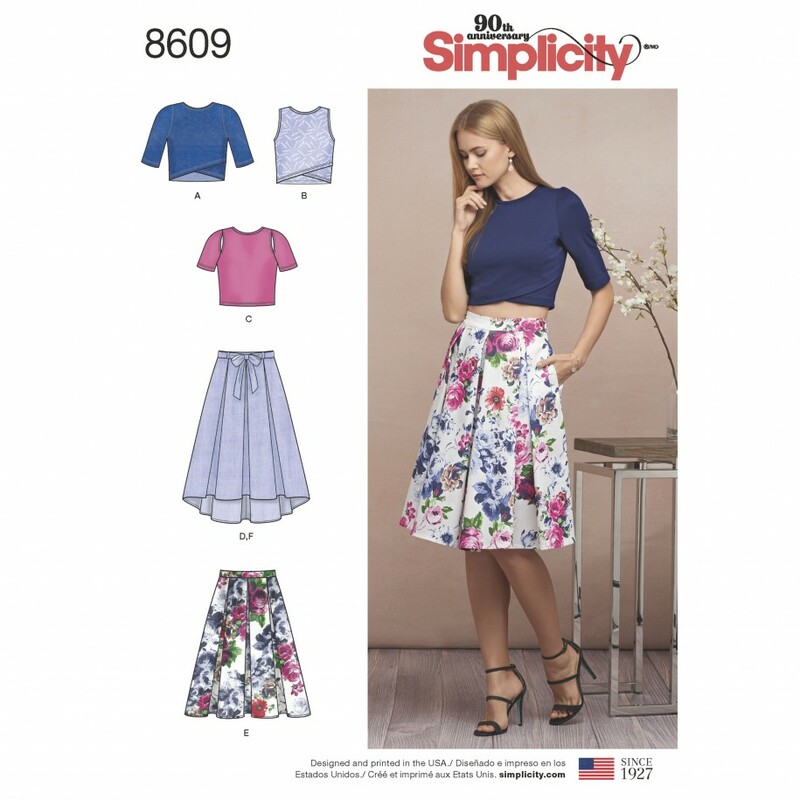 WOW this whole outfit is stunning and you're right - together they are the bomb :) I had trouble recently with an armscye in a Simplicity pattern. It came out so wonky when the sleeves were attached I removed them to just make it sleeveless but even after I'd attached the bias tape they were wonky. I'm done now and will wear it likely sometimes but I was mad too because I'd used a good 2 m. of lovely Liberty lawn! I'll wear it but it's made me very hesitant re buying any more Simplicity. Thanks Kathleen! I find sleeve/armscye problems are the worst, mainly because I'm not as confident in fixing them! It's a shame about yours, but glad you managed to make it work in the end! Luckily this used such a tiny amount and I *think* I understand the changes I'll need to make for next time! Nice! They do look really good together: cool but very wearable. Thanks so much Catherine! It's a venture away from my normal silhouette but I'm liking it! This. Looks. AWESOME!! What a beautiful combo! It answers the question "What if a bunch of lilacs were actually a super cool lady"? What a perfect outfit! I love both of these separates,you always sew the most gorgeous things. Stitcher's Brew Podcast - Episode 18!